I stripped the engine down completely to check on all the components. I ordered a new cylinder, new piston, rings and bearings. I had the crank tested and it was found to have a small crack at the prop hub end. I had to order another to replace it. 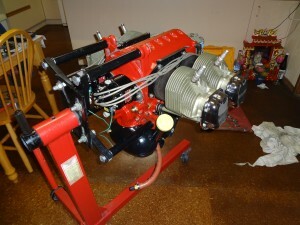 The build went smoothly although I did break the last piston ring to be fitted so had to wait for a new set to arrive. 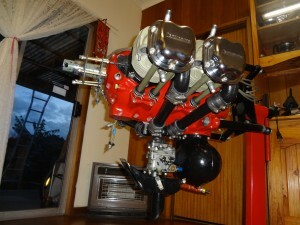 All the time the engine was on the stand in the kitchen! After fitting the engine and running it, I found the mixture was variable and the engine would not run smoothly without carb heat. 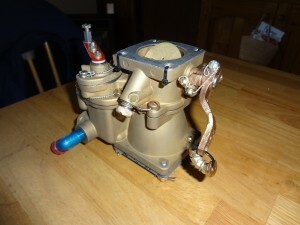 I eventually had the carb rebuilt by Bob Kachergius. A beautiful job although the shipping to and from the US was a bit expensive. 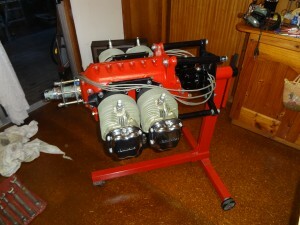 I refitted the carb and now the engine starts and runs beautifully.